One of the things that everybody who lives in Phoenix, Arizona agrees on is that it's always changing. You turn around and the old buildings you recognized are gone. But unless you are over 150 years old, or are an obsessive history-buff like me, you don't realize that the version of the city you see has changed several times. And each time it is has changed, the city has become virtually unrecognizable to the people who knew it "back in the day". Phoenix version 1.0 - Oddly enough, Phoenix didn't even start where downtown Phoenix is today. In 1868, it started with a settlement at where 40th Street and Van Buren is now. Google "Mill City" or "Pumpkinville". Really. Phoenix version 1.1 - Then the Phoenix Townsite was established in 1870, several miles west of the original settlement. There really wasn't all that much of a difference between the Townsite and the Settlement, mostly adobe buildings. Whatever building materials had to be found in the local mud, mesquite trees, or if there was money to spend, it was hauled down by teams of oxen from places like Prescott. Phoenix version 2.0 - The arrival of the Phoenix and Maricopa Railroad on July 4th, 1887 changed everything. The railroad meant that timber, and more importantly, bricks, were now available, and relatively inexpensive. The old adobe buildings were abandoned, some were knocked down, and the huge building boom of the 1890s changed the face of Phoenix from looking like a sad "mud hut" place to a real town with real brick buildings. Phoenix version 3.0 - The prosperity of the 1920s was the time that Phoenix knocked down most of it's old brick territorial buildings and started replacing them with modern skyscrapers. It actually started in 1919, with the Heard Building, and the building boom went on through the early 1930s, and only stopped because of the great depression. 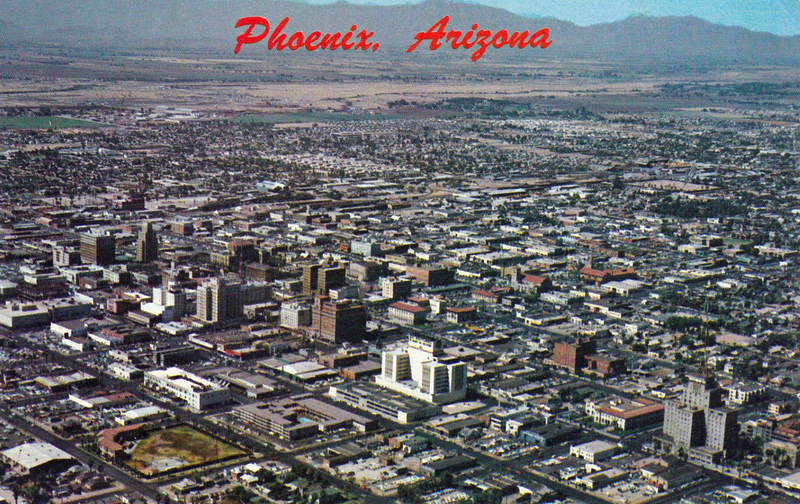 Phoenix version 4.0 - After World War II ended, in 1945, Phoenix grew explosively. But at this time there was less need to knock down old buildings. Instead, they were abandoned as the city spread towards the north and east. Phoenix version 5.0 - By the 1960s, many of old buildings in downtown Phoenix were beyond saving. Efforts began to clear out the squalor, starting with Valley Center in 1972. But the real activity was happening in midtown on Central, around the new Park Central Mall. Phoenix version 6.0 - Phoenix began another big push to "revitalize" downtown in the 1990s. Once-classic buildings that had become dive bars and flop houses had been condemned and razed for years, but had only left empty lots, and at best, parking lots. Phoenix version 6.1 - In the 21st Century, Phoenix started building light rail. If you remember version 6.0, you will be surprised to see how much it has changed already. But that's what Phoenix does!